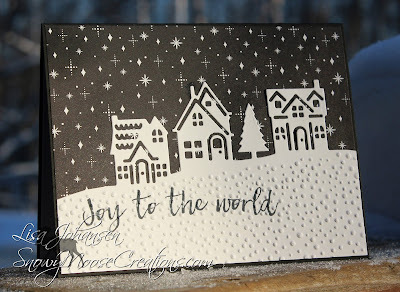 It's time for a new challenge at Sunday Stamps and this week we have a fun sketch from Monika. Usually I'm pretty literal when it comes to sketches but I went a little broad with my interpretation, as I had a certain idea running through my head. I used a die from SU's Hometown Greetings Edgelits that has 3 houses, along with a tree. 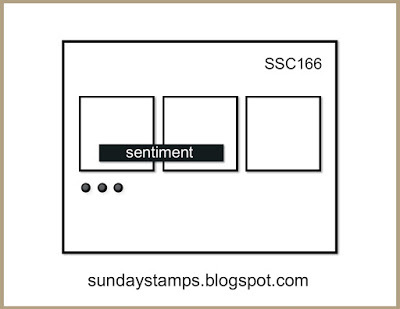 For the sketch I'm using the houses as the squares, and then I placed the sentiment below the first few houses. Instead of placing 3 embellishments under the sentiment I decided to emboss the bottom of the scene with snow, making those my circles from the sketch. Head on over to the Sunday Stamps blog to see how the rest of the DT interpreted the sketch and then play along with us, we'd love to see your take on it! this is beautiful! Consider it CASED by me. Love the simplicity and yet wow factor! I love this take on this week's sketch. Using a edgelit is a perfect idea! Thanks so much for stopping by and leaving a comment, its always appreciated! Visit Lisa's profile on Pinterest. I live in beautiful southcentral Alaska, and the winters here are my favorite. As soon as the snow starts to fly I am outside enjoying every minute of it. I love to go out and watch the moose, they are an incredible animal and one of my favorite things about living in Alaska. When I'm not outside with my camera I am indoors, either stamping or spending time with my family. I've been married 23+ yrs to my wonderful hubby and we have 3 grown kids, 4 dogs and 2 cats! I'm a Navy veteran and hubby is a retired Navy Corpsman, and thanks to the military we've lived all over the US. I am a proud supporter of the men and women who volunteer to serve this great nation of ours!